The Futurist: Who Does America View Favorably? Who Does America View Favorably? Earlier, I had written an article titled Who Hates America?, discussing how America is perceived by various countries, and then drawing corelations between the nature of these societies themselves and their likely opinion of American society. The chart of opinions on America constructed by the Pew Research Center is included again here for easy reference. This article continues to receive heated opinions on both sides of the debate across the blogosphere. Now, I present the exact reverse of that article, in assessing how America perceives other countries in the world. A survey conducted by Angus Reid Consultants asks Americans if they feel the relationship the United States has with particular countries is favorable or not. Many of the same countries queried in the Pew survey are also queried here, allowing for easy cross-comparison. Anti-Americans will be irritated by the notion that Americans could even have the right to judge other countries, what with moral equivalence and all, which makes this examination even more worthwhile. It seems that the countries that view America favorably have a strong corelation with those that Americans view favorably, and vice-versa, deepening the evidence that these opinions may be based on the same basic dimensions of innate psychological traits of cultures, and thus more deep-seated and well-informed rather than merely fashionable. Americans consider Britain to be their strongest ally. This is unsurprising, given Britain's near-unconditional support of US military efforts for the last century. Beyond this, other favorably viewed countries are fellow democratic, secular members of the Anglosphere like Canada and India. Given that India was the most pro-US country in the Pew survey, the jump in American favorable perceptions of India from 52.1% to 54.8% from just March to June 2006 indicates a warming of Indo-US ties in both directions. This is of massive significance on political, economic, military, and ideological levels. The large drop in how Mexico is perceived by Americans is also evidence of the Mexican government treating their practice of dumping their unwanted citizens into the US as an entitlement. The American people are that much closer to getting fed up with Mexico's abuse of America's accomodative stance, and they should be very careful about pushing the generosity of the American public too far. 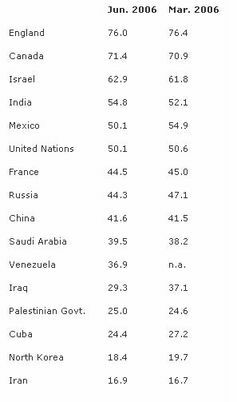 Also unsurprising is that nations that view America unfavorably are also the ones that Americans view unfavorably. These tend to be communist countries, dictatorships, or terror-sponsoring rogue regimes. A core anti-American shibboleth is that 'the rest of the world hates America'. Indeed, the undemocratic regimes that the anti-Americans tacitly support do indicate this, but democratic, liberal societies do not. This complies with the anti-American opposition to the success of democracy in general throughout the world (siding with Hizbollah against Israel, Pakistan against India, North Vietnam against South Vietnam, etc.). Remember, be judged by the character of those who like you, but also those who dislike you. By this measure, America's moral standing looks quite robust.